Forums Home > General Forum > Greens of Silsden - timber merchants, do you know what happened to them? Topic : Greens of Silsden - timber merchants, do you know what happened to them? I received the folowing email from Joe Moore - perhaps someone can help? I am looking for information about Greens of Silsden. I wonder if you might point me in the right direction to information or hopefully pictures of the firm. Has there ever been any publications about Greens? This in connection with the village history that I'm working on of Dullingham in Cambridgeshire. Greens of Silsden were very much part of our village history in the 1930/early40s. Greens took timber of the Dullingham Estate (& the Stetchworth & Woodditton Estates) most years during this period. There was always plenty of mature oaks & other hardwood trees in this area. Greens arrived complete with usually two teams of beautiful horses, timber wagons & other equipment, & lodged in the village when pulling the timber out & loading it at the local station. I often think the men were the first 'foreign' people we ever heard as children, with their strong Yorkshire dialect. My father always took me to watch the horses working. Just as a postscript, one year a motorised yellow timber wagon with caterpillar tractor on top arrived in the village (it must have been near the start of the war), things were never the same again after, how we loved the horses. I hope that I have not rambled on too much, but I do want to include Greens in the history of my village. Any help or advice to where I can find out about Greens will be really appreciated. Yours sincerely ~ Joe Moore. To Joe Moore)I was very intrested in your letter regarding the Greens of Silsden.Two of my fathers Uncles,John and Arthur Green from Silsden were timber merchants,both born in the1870s and 80s.I am just beginning to research the Green family history,but I do know that the Green family from Silsden goes back along way. Iwould be happy to put you in touch with my father,M Green who would no doubt be able to give you more infomation.I also would be intrested to hear any memories you may have,about the Greens. I am very interested in Aurther Green timber merchant as my father S.R. Reg Postlethwaite of Blawith Nr Ulverston, worked for him before 1935; throughout the north, Knighton, Wales and Essex, that I know of. I would love to be put in touch with Julie Betts and her father to learn more about the firm. I have quite a lot of photograps of my Dad with his men and their horses. The following is from the research made by Joe Moore. 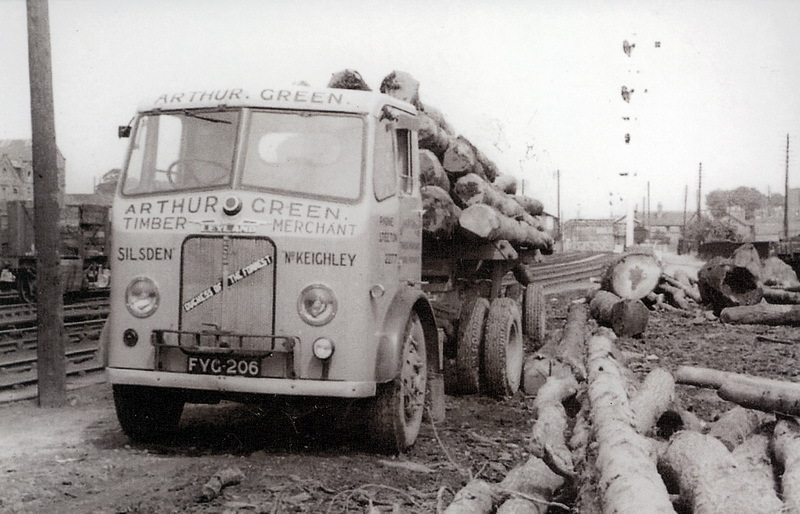 A brief history of the Greens of Silsden from the book "Round Timber Haulage". As I remember there were two Greens in Silsden both in Timber, one had offices in Bolton Road, the bungalow above the sub station, the other had offices in Skipton Road adjoining Barret Street. Can anyone offer any info? Oddly enough its the Citoen that I remember, they had a rather strange steering sheen in those days, perhaps they still do. I'm about 6 years too late on this but I was googling around online and came across this forum. In the pdf article that was posted by Joe Moore it gave a brief history of Arthur Green's of Silsden and said that the company was inherited by Richard and Andrew Green. Well Andrew Green is my father! He and Richard still own the company although it's in name only now as it hasn't worked for years unfortunately due to the way the timber market has been. Richard still runs the haulage business but the business has been reduced to a more minimal size now both of them are over 65. I'm sure my dad be happy to help with any research or interest people may still have. p.s. Julie I think this makes us related! Hi All , I've great interest in this subject " Arthur Green & Sons "
My Dad worked for the company from approx. 1952 to late 1980's. Not only him, but also my Uncles ( his Brothers ) John and George. I was born in 1956 so I don't remember the early years, but I've heard so many stories about life and times working in the timber trade I could write a book ! . Though my Dad's time in the woods was a little later than the original post and photo of horse drawn haulage,I understand that, because the workers often took lodgings nearby for the duration of the work, they became close to the community. I could go on and on about a dozen or more other fella's that worked for Greens at that time, the life they had, the stories I listened to as a kid. I only went to the "Office " with my Dad a couple of times, but I believe it was in " Longbottoms Yard " half way down a hill in Silsden. We also have a copy of " Round Timber Haulage " , pride of place on the bookshelf !!! I'd love some more contact on the above please. Either on here or by email. tooarrjaa@hotmail.co.uk Thanks for the chance to say my bit. Anyway, I remember my Dad talking about Arthur " the boss " in the early years. Then times changed, these new young upstart's appeard on the schene ( HaHa ). As far as I remember, it was Richard that took more of an interest in woodcutting than Andrew. It was fantastic that I had a chance to talk to Richard Green about old times when my Dad worked for " Greens " . He explained that the name still lives on with the historic wagons he and Andrew take out on runs throughout the year. I hope to catch up with them on one such event ! Swap a few Photo's and stuff. Maybe this Sunday ( 6-8-17 ) on the Trans Pennine Run to Harrogate . Theres a few pics on google. I finally made it a few weeks back to watch the vehicles arrive in Harrogate on the trans pennine run . Unfortunately only one of the Greens lorries was healthy enough to make the run , but I did track down Andrew ( who was bathing in the sunshine ! )and introduce myself as the Son of his former employee ( Les Jarvis ). I much appreciate Andrew allowing a few moments of his time to reminisce . Though its a number of years now since my Dad died , on days like that I can still feel myself turning my head to say " Hey up , what ya think of thaten "
Just to add a few names to the list of fellas my Dad worked with , to add a bit of interest :- John Jarvis , George Jarvis , George Fairburn , Don Tuer , Charlie Burton , Harold Humplby ( Stemmy ), Pete Stelling , Pedler Parmer , Des Pickard and many more ! DON'T FORGET THE SUBJECT IS >>>>>>>> Forums Home > General Forum > Greens of Silsden - timber merchants, do you know what happened to them?